← Central City Rollergirls take second place at Tattoo Freeze 2012 Tournament! Bad Apples through to Intra League Final! 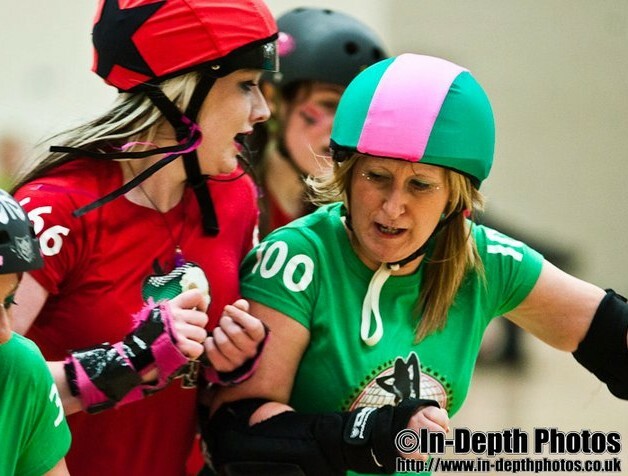 The second of CCR’s home season bouts saw the Bad Apples take on last year’s champions the Disco Beaters. The lead changed hands many times during the close match-up and a last jam power play for the Disco Beaters saw another nailbiter going to the final buzzer. The Bad Apples managed to hold the Disco Beaters off to secure a 136 – 123 victory. 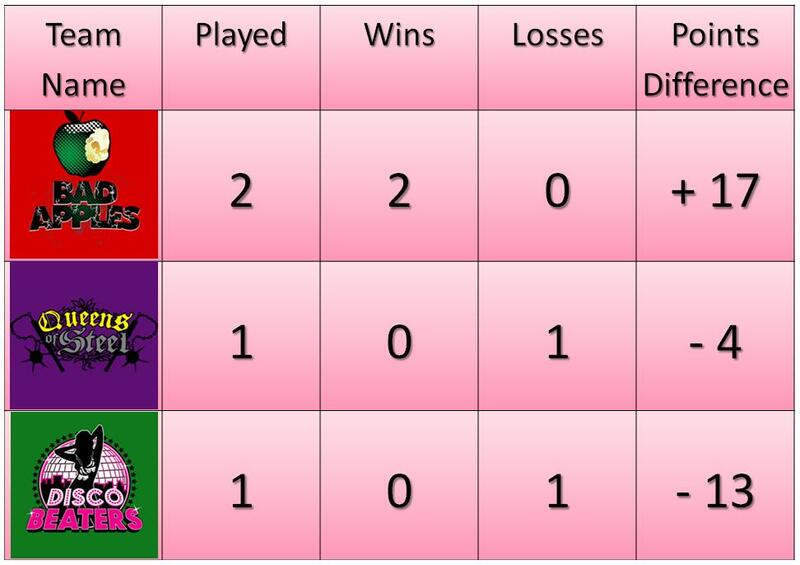 Results so far this season echo those of last season where the Bad Apples won their opening two games of the season, to be first through to the final. Can defending Champions Disco Beaters recover from this set back and make it through to their second consecutive final? Can Queens of Steel stage a comeback taking them to the final for the first time? All eyes are on the next home team bout on April 14th where the Queens of Steel take on the Disco Beaters for the final spot. The winner will take on the Bad Apples in the Grand Final on 2nd June. BAD APPLES: 69 Verry Cherry (Captain); 04 Lex Brawl (Co-Captain); 3 Tinchy Slyder; MC5 Kitty Killa; 29 Gerty Go-Go; 666 Tragic Wrath; 1337 Incredible Hulse; 5000 Boots Manuva; Guests 23 Harm Honey; 28 Betty Bloodshed; 44 Nokturnal; 360 X Blox; 429 Thumpalina; 707 Jelly Mean; 1212 Lola Whip. Bench Manager – Madame Flutterby; LUM – Little Nicky. DISCO BEATERS: 82 Hustle Her (Captain); 92 Red Gorevette (Co-Captain); 10 Bunny Massacre; 43 Beth Metal; 85 Lethal Sizzle; 100 Dynomite Bo; Guests 27 Germaine Leer; 25 Faze Her; 61 Erin Blockavitch; 72 Bette Outta Hell; 80 Skar Siren; 101 Cruel Heller; 404 Typhoid Mary; 434 Dr InKnockulator; 8080 Brigitte Wheelson. Bench Manager – Tuppeny Hit; LUM – Ouija Broad. CCR are next in action when the Belles of Centrinnians make their way to Manchester to take on Rainy City Rollergirls on Sat 11th Feb.